*Virtual Editions are digitally printed on demand to the exact specifications of the artist, in a limited edition. Each Virtual Edition is sold with a certificate of authenticity. 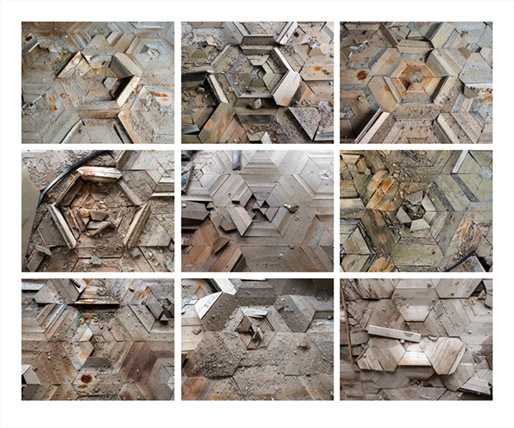 Parquet Floor Variations, Prypiat, Ukraine shows nine sections of a department store floor found in the city of Prypiat, uninhabitable since the accident at the nearby Chernobyl nuclear power plant. The photographs forming the basis of the print were made in 2016, thirty years after the accident. The floor reflects the general decay apparent in all of the built surfaces of Prypiat, and although each floor section was identical to the next when first laid, each has deteriorated in its own way. David McMillan began his career as a painter but gradually became more involved with photography. A concern for the vulnerability of the environment led him to photograph in the Chernobyl Exclusion Zone, the site of what is considered to be the world's worst nuclear accident. The work, begun in 1994, has resulted in many exhibitions and a book of the photographs, David McMillan: Growth and Decay; Prypiat and the Chernobyl Exclusion Zone, to be published by Steidl in 2019. Parquet Floor Variations, Prypiat, Ukraine will be on display in the Martha Street Studio gallery from December 14th to 21st. Also featured in the gallery will be past Studio Editions, including work by Lisa Stinner-Kun, Michael Dumontier & Neil Farber, and more.